When Disney execs decided to enter the cruise business they looked back to the 1920s for inspiration. The result: Both Disney Magic and Disney Wonder resemble luxurious ocean liners of a bygone era that just happen to have all the modern bells and whistles to boot. The twin ships' elongated dark blue hulls, matching red funnels and elaborate yellow insignias make these sleek ships a beautiful sight to behold in port. Inside, the ambiance is casually elegant with plenty of subtle nods to the Mouse that started it all, from the etched-in-pewter characters bordering the atrium to the hidden mini-Mickeys in the adults-only restaurant's china pattern. What Disney Cruise Line does best though is prove that "elegant" and "family-friendly" don't have to be mutually exclusive. 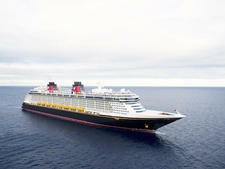 Disney offers one of the most distinctive cruise experiences afloat. With these ships, Disney has introduced a number of innovations. Chief among them are its cabins with a bath-and-a-half and a rotating dining room schedule in which passengers eat at three different restaurants, albeit with the same tablemates and waitstaff. It was the first cruise line to launch the "soda card" concept, an idea which has been picked up by competitors, and now they've even gone one better, offering soda gratis in the three restaurants and at the self-service beverage stations on the pool deck. Equally distinctive is what Disney ships don't have: casinos or libraries. 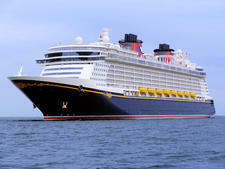 Though the line operated a two-ship fleet for nearly a decade, Disney built two new ships (Dream and Fantasy), that are significantly larger than Magic and Wonder -- two decks higher and measuring 128,690 tons. They will do this again in the 2020s with their two largest ships yet. While the passenger count is 2,500, it's important to note that Disney's load factor is the highest in the industry (remember: lots of kids). The typical passenger count onboard will be in the range of 3,500 to 4,000 people. A child's wonderland with magical portholes, the AquaDuck water coaster and princess makeovers, but plenty of adults-only spots as well; 4,000 cruisers. Princess and Mickey Mouse meet-and-greets, paintings that come to life, a water coaster at sea, Star Wars-themed kids play area and top-notch Disney stage shows. Holds less than 3,000 cruisers; highlights include the Broadway-caliber "Tangled the Musical," AquaDuck water coaster and water park with toddler splash zone. Holds less than 3,000; highlights include the Broadway-caliber "Frozen" musical, the New Orleans-inspired Tiana's Place restaurant and character meet-and-greets. The ambiance onboard all Disney ships is casually elegant with plenty of subtle nods to the Mouse that started it all, from the etched-in-pewter characters bordering the atrium to the hidden mini-Mickeys in the adults-only restaurant's china pattern. 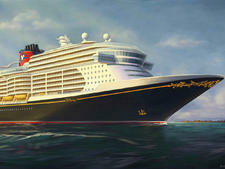 What Disney Cruise Line does best is prove that "elegant" and "family-friendly" don't have to be mutually exclusive. Disney Cruise Line's four ships are family-friendly, offering the elaborate Walt Disney Theatre, which resembles a plush Broadway house, and the Buena Vista Cinema, which features Disney flicks. D Lounge is a family play area with a stage (and even a bar open during performances) that encourages families to spend time together singing karaoke, playing games or participating in other activities like trivia. The main pool areas on all four ships are geared toward families; there's a pool for younger kids with a 200-ft. Mickey water slide, and a small sprinkler tub for toddlers. An adults-only pool exists as well on Magic and Wonder, though on Dream and Fantasy the grownup area encompasses several decks and bars. Dream and Fantasy stepped up the waterpark-at-sea aspect by adding the AquaDuck, the first-ever watercoaster on a cruise ship. Clearly visible atop the ship, the coaster features a transparent, acrylic tube that propels riders along on a raft, up and down four decks of the ship -- at one point swinging out 13 feet off the side, 150 feet above the ocean. For a real soak, kids (and adults) can head to Disney Fantasy's AquaLab, which explains the genesis of the AquaDuck. Basically, it's just a way to get wet standing up, as water pours out of buckets, through holes in the wall and from fountain jets on the deck. Older folks have more than a pool in which to escape. Palo is a boutique eatery on each ship featuring northern Italian cuisine; reserve the minute you get onboard. For a real splurge, Remy offers top-of-the-line French fare on Dream and Fantasy and comes with a $95 tab -- the highest at sea. The spa is also largely off-limits to the younger generation (although there is a Chill Teen Spa with specialized services); one of the highlights is the spa's adults-only rain forest steam room. Another compelling part of the ship for those 21-and-older is the adults-only stretch of bars, lounges and nightclubs called "After Hours"; among the options are a dance club and sports pub. There are family cabins that hold six, but Disney's roomier-than-average staterooms can handle at least four. Forty-four percent of outside cabins have verandas. All come with bathtubs, a television, a safe and a hair dryer. The children's program is organized and run by dozens of caring youth counselors; scheduled character greetings occur throughout the day (and many surprise visits, too). The inclusion of onboard It's a Small World nurseries filled a void for parents looking for childcare for their infants through age 3. Spanning nearly an entire deck, Disney's Oceaneer Club is a supervised program for children aged 3 to 7, split into age groups of 3 to 4 and 5 to 7. The Oceaneer Lab is split into groups for kids aged 8 to 9 and 10 to 12, and offers high-tech interactive programs, hands-on science experiments and shipwide treasure hunts. Kids 11 to 12 can compete in a marine biology knowledge game show and send digital postcards to friends. Teens 11 to 13 head to Edge, while 14 to 17s chill in Vibe (which includes an outdoor area with hot tubs). Both clubs are outfitted with comfy furniture and the latest videogaming equipment. Children's facilities are open from 9 a.m. until 1 a.m., though times can vary. Once signed in onboard the ship, your children are automatically enrolled in the children's programs on Castaway Cay. There are supervised games for the individual age groups, and bike riding. However, take note that they do not take the children swimming. Disney character appearances are scheduled several times daily on the private island. The majority of fellow passengers are families and multigenerational reunions due to the extensive activities and options available to children, teens and adults. However, you'll also find a sprinkling of honeymooners and couples without children -- especially on Alaska itineraries -- who appreciate the oversized staterooms and underutilized adults-only areas. The 1,754-passenger Disney Magic and Disney Wonder, launched in 1998 and 1999, respectively, are sister ships and carry the same basic themes throughout -- with different individual touches along the way. Disney Magic, for instance, has an art deco theme while Disney Wonder is more art nouveau. 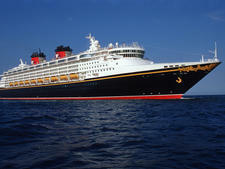 In 2011, Disney introduced its first new-build since Disney Wonder launched in 1999: the 128,690-ton, 2,500-passenger Disney Dream debuted on January 26, 2011. 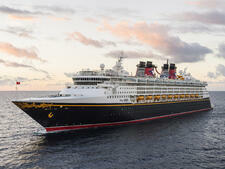 A sister ship, Disney Fantasy, debuted on March 31, 2012. In March 2016, Disney announced two new 135,000-ton ships will be built by the Meyer Werft shipyard in Germany, arriving in 2021 and 2023, respectively. They will have 1,250 cabins.